I found out last night that today would be Alexander’s dad’s last day of radiation therapy. He started just before we arrived and left the house early each morning for his sessions, returning a little tired every time, but always trying to stay positive and take it in his stride. To celebrate his final session I decided to try my hand at clafouti again. The first time I made it was for an HHDD challenge and it came out a bit of wreck I think. Why I decided to make something I thought I was no good at for a special occasion I don’t know, I’m weird that way. Luckily for me (and the other people at the breakfast table) it came out fine. A cake crust-like texture on top with the center the consistency of custard. 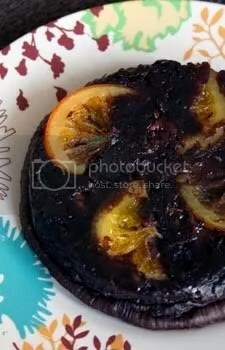 I found the recipe at allrecipes.com and followed it exactly, only reading some of the suggestions afterwards. Again, I am weird that way. 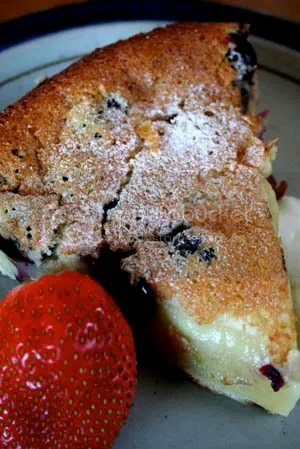 One person suggested adding more flour to the batter to ensure that the clafouti’s crust is nice and cake like and also do not fall after baking, which is what happened to mine, but just a little. But only when using fruit that’s more moist, like blueberries, if using cherries you’d probably be fine using the amount of flour used in the recipe. Heat the oven to 350F and grease an 8*8 inch baking dish. Arrange the berries in the dish and set aside. In a mixing bowl, whisk the eggs and egg yolk until light and foamy, add the sugar and mix until the mixture starts thickening. One-by-one, add the milk, vanilla and flour, and salt, stirring between additions. Whisk until the mixture is light. Pour over the berries and bake in the center of the oven for about 45 minutes. 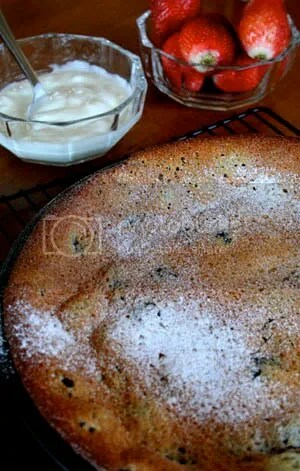 Let the clafouti cool slightly, dust with confectionar’s sugar, cut and serve right away for breakfast, or tea. Ours we enjoyed with some fresh strawberries on the side and plain yogurt. I think it was the perfect breakfast for a celebration! I was convinced that I would not make the deadline for this round of HHDD. Between extensive vacation time, traveling, quitting my job (yes!) and taking on some new tasks I experimented a bit with the theme for this round, clafoutis, but they came out more like cla-floppies. Kind of tasty, but terrible to look at. Then industrious host and winner of the last round, Bron, notified me that the deadline was extended by a week. Phew! So Monday afternoon after work I rushed home with my new ingredients and set to work on another attempt. And I think it kind of worked. Bron’s original Donna Hay recipe was for plum and chocolate clafoutis. As I am a big fan of chocolate I decided not to stray too far from the original recipe. 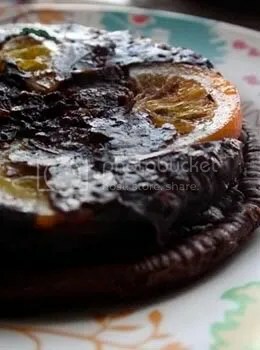 I am also a big fan of dark chocolate with orange and so decided to make chocolate and orange clafoutis. Now I don’t know anything about clafoutis to be honest, so I have no idea what the actual texture or taste should be like, wikipedia.org says it’s close to pancake batter and judging by all the pictures I’ve seen that seems to be correct. If that is the case then this was another round of cla-floppies because mine came out more with a brownie consistency even though I followed the recipe pretty closely. But it looks much better than previous attempts, so I’m entering it! Preheat the oven to 180C. Sift flour, cocoa and sugar in a bowl and set aside. In a separate bowl, stir together the eggs, cream and vanilla and then whisk together with the dry ingredients. Stir in the chocolate and orange zest. Melt the butter and divide between two small baking pans (ideally it should 2-cup capacity pans, mine were a bit bigger but worked fine). 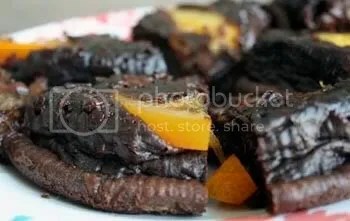 Place the orange slices at the bottom of the pan and pour half the batter into each, bake for 20-25 minutes or until cooked through, it should be puffed up. Let it cool and then flip it out onto a plate so that the orange slices are at the top and enjoy! Now that I think about it and look at the pictures more closely, I guess that the texture might look right for a clafouti, but when you eat it it certainly has a much more brownie-like texture. I’m beginning to suspect that I unknowingly added a bit more than a cup of chocolate. So sue me for being over-indulgent. I’m looking forward to your round-up, Bron. Thanks for hosting and introducing me to a new delight. Thanks also to Barbara for initiating this fun event. I’m looking forward to more!